Level D is recommended for either 3rd or 4th grade classrooms. 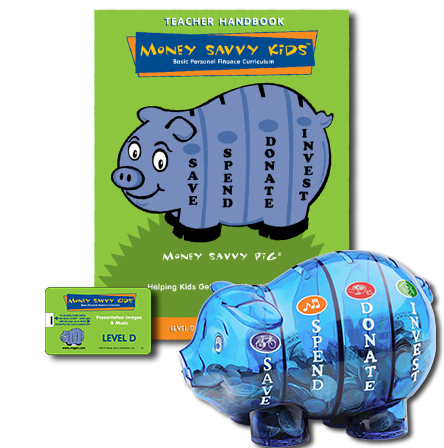 Students will work with the Money Savvy Pig piggy bank on a classroom versus individual basis. 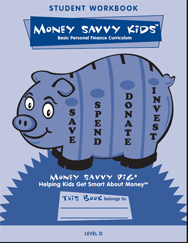 Each of the four lessons has three exercises that help students practice their new financial knowledge and helps teachers assess how well the material has been learned. The work-sheets, some done individually and some done as a group, incorporate word games, puzzles, math problems and even an art project. Each 90 minute lesson is broken down into two 45-minute segments; 45-minutes for classroom instruction and 45-minutes for completion of the tree activities that accompany each lesson. All instructional materials are included. Total teaching time required: 6 hrs. Pre-requisite: Level C.